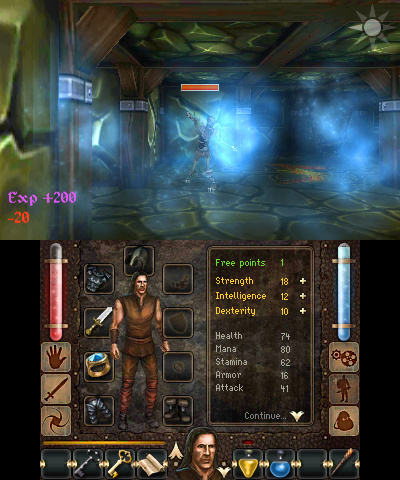 Many dungeon crawlers tend to come pre-packaged with a dose of nostalgia through the nature of the genre alone, their exploration and equipment elements resonating as familiar conventions. 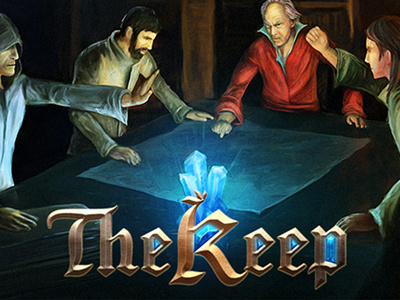 Stick with a medieval fantasy theme like The Keep and it feels even more from Yon Olde School. The story of The Keep is kept rather simple: the evil mage Watrys has holed up in a tower over some mines, wreaking havoc on the nearby populace and taking their children as slaves. The hero arrives to drive the wizard out, but naturally ends up facing a long slog through dark places to reach the final battle. While the plot doesn’t feel like anything new, it’s still soundly written, with between-chapter narration and a bit of in-game dialogue fleshing things out a bit. Everything including the reading of signs is voice-acted as well, and nicely so. Storming The Keep’s 10 levels means navigating the environs, solving puzzles, avoiding traps, and slaying the nasty inhabitants. 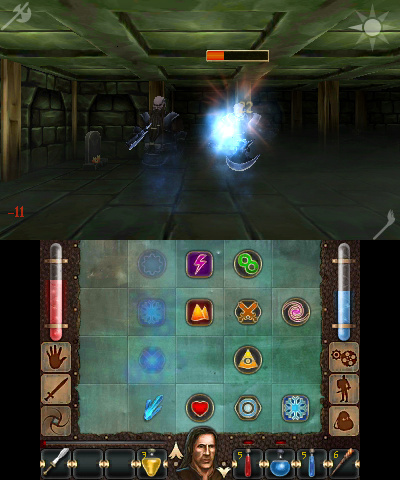 Almost no buttons are involved in this; while the Circle Pad is used to move, the touch screen is the centre of item interaction, equipment arrangement, and combat. The primary control setting uses the L button for strafing and the D-Pad for a quick-select of the item/melee/magic screens, but a couple of other schemes switch things up if required by mapping movement entirely to the right-side buttons to allow left-handed players more comfort with the stylus. The touch-centred system works rather well within the first-person perspective of the game, although some elements may take some practice to get used to. The melee combat system proved somewhat frustrating at first. On the surface, its 9-square grid looks like an easy game of Tic-Tac-Die: just swipe the stylus through three blocks in a row, line, or diagonal to pull off a spatially-related weapon strike, with certain foes hurt more by different areas of attack. The instinct will be to swipe like mad, but The Keep is simply not set up for rapid fire. Not only is there a regenerating stamina gauge that limits the number of melee swipes performed at one time, the general system has a timing that seems to prevent blowing this gauge at once. This doesn’t pan out as much of a problem in the game once you get the feeling down, as enemies rarely attack faster than you do, but some players could still find it a bothersome adjustment. The magic system, in comparison, feels more engaging and rewarding. A large grid on the magic screen becomes the home for various runes found through the game. Place runes in a certain order as revealed by scrolls, then swipe the stylus over those runes to cast the corresponding spell. The same rune can be a component in more than one spell, allowing you to set up a quaint crossword of pain on your touch screen. A slowly rebuilding magic gauge will limit your magical frequency and runes have different cool-down periods before they can be used again, so ideally you will want to have both melee and magic decently figured out. The Keep’s pace will reward a thoughtful approach more often than a charge into a room with stylus swinging. Limited enemies means one can’t eventually grind their way out of a situation, and an awareness of the map and enemies will often be key to avoid getting cornered and hacked apart. The puzzles are also cleverly implemented for the most part, encouraging different approaches and experimentation to proceed. There was only one time it felt like dumb luck when lever pulling was needed to proceed, but a clue could very well have been missed. While it feels great to best the challenges in The Keep, be warned that this is not a game that will easily reveal the way out. Your character will level up (both overall from gaining XP and individually in melee and spellcasting through their use) and find equipment to grow more resilient, but he still feels fragile; there’s always the feeling that the next room could contain something to snuff him out. Saving can happen anytime, and frequent use of that option is recommended. The game does also include a permadeath option, however, if you want to be committed [to an institution]. Expect about 6-7 hours of play in normal mode, but this could vary widely depending on one’s successes. The overall presentation is good, with decently rendered characters. The environments themselves can feel repetitive, but this is likely by choice (hello, dungeons). The music and sound are also fine; none of it is particularly memorable outside the game, but definitely provides the right kind of atmosphere when within it. The Keep is not a manic rampage with 16 different flavours of battle axe exploding from slain enemies. Focused more on adventure than conquest, it hearkens back to the first-person dungeon crawlers of the ‘90s while adding a couple of fresh, touch-based elements. There are still some parts that one might consider modernizing further, such as character customization, an instant save button, or an inventory system that makes it easier to swap runes and equipment, but the overall experience is still solid and quite enjoyable once rules and style become clear. Fans of classic-style dungeon crawls who appreciate some thought with their questing should add an -er to the end of this title. Looks like a portable Legend of Grimrock. I'll definitely keep it in mind. This is exactly the type of review I was looking for before buying this. Since, to my shame, I haven't played all the Etrian titles yet, I have plenty of quality dungeon crawling available to me; so more of the same doesn't cut it, in part because I just don't have enough time for more of the same. But I can find the time to crawl in ways I haven't done before. Thanks for the great review, really wanted your input before picking it up and will be doing so! I know Miiverse has been absolutely LOVING this game. Glad to read someone's "official" review finally. I've been waiting for this forever! Nice review and I'll pick this up Soon. Bought this day 1, really good so far. Liking it more then i liked Grimrock. iirc there is a Wii U version planned, right? This game looks really good but if there is a Wii U version on the way I'd rather hold out for that one. I've been waiting for this review before I purchased this. I loved the Eye of the Beholder series of the past. I don't really care for this type of shizang, and any comparison to Etrian Odyssey won't help... that thing looks like my worst nightmare!!! The memories of Ultima Underworld come back to me. I've been awaiting a review from you guys on this one. I'll definitely pick this up later or if it ever goes on sale. already took the leap and I am enjoying it so far. Magic is a pain but otherwise don't have any other real complaints. Finished it and quite agree with the melee/spell system mentioned in the review. 'Course, I did opt to pump my intelligence and go for a mage like character so I don't know if pumping strength would make melee combat more bearable since I'm hitting once every 5-6 swings as a mage character. The spells on the other hand are rather diverse and have great utility for a game of this length. Overall a fun dungeon romp... Now bring Grimrock over too! I was not expecting this to be such a good game. Pleasantly surprised. Good. I was hoping it received a relatively high score. I love it. It reminds me of the old Ultima Underworld game. This game isn't easy at all. I've died countless times and have found that kiting most monsters is the way to go. Kiting is a way of fighting where you shoot a fireball from a distance back up a few spaces and do it again. 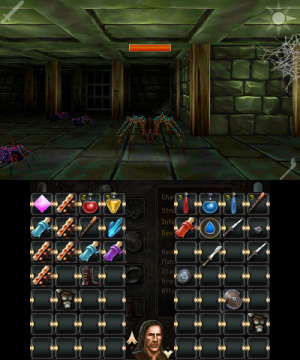 The spiders at the beginning were getting me until I started kiting them around the dungeon. Save alot! I've been saving after every single kill. The next monster might just take you out. 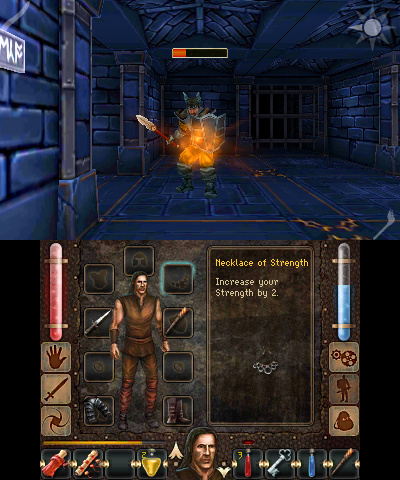 Graphics are pretty sweet for an old school dungeon crawler and I love the auto mapping. Great score the game deserves an 8 I would rank it a 7.5 or 8. Neat game! I'd been waiting for a game like this since I played Orcs & Elves on the DS. I'm glad it finally arrived. The combat takes some getting used to (I was playing too fast, and it's not meant for speed, but thoughtfulness), but I'm absolutely loving it. The 3DS badly needs more Western-flavored games, and this is a good start. This game sounds AWESOME, definitely picking it up when I have the chance. Looks promising as I love old school dungeon crawlers. $13 though.....seems a bit pricey. On sale for $8. I think it's time to try this puppy out. @Priceless_Spork there is also left-handed control scheme available in this game.